I thought for this blog, I'd do a list of Seven Important Things on my desk. They're not all quite on, more around or above or next to, but they're all things I can see while I'm sitting at my desk, and all things that are important or special to me for one reason or another. It's a lovely space to work. Tucked away in a corner, nice and secluded and quiet. My daughter bought me this for Christmas and I absolutely love it. The scrabble squares are on an electric wire, you stick the letters on you want, plug it in, and it lights up. Brilliant! Unfortunately, though (as I'm sure you've noticed), there weren't enough squares to do the whole 'Keep Writing' so it's minus the G. It hangs at the top of the wall in front of my desk and reminds me to....well, just keep writing! I don't know exactly what you'd call this. A mood board? Inspiration? Research? It's a collection of images I printed off when I started writing Cell 7, to help me with the mood of it, the feel, to help me picture what a TV station looks like, the cells, and the characters too. If you have a look you'll see stills from Fox News, photographs of court rooms and of the Old Bailey, lots of pictures of different cells, and 'beds' that are used when administering the lethal injection. Also at the top is a quote from Gandhi, it says 'There is a higher court than courts of justice and that is the court of conscience. It supercedes all other courts', which presided over all the writing of Cell 7. It was good to come into the room, sit at my desk, and take a moment to look at the images before launching into the writing. Notebooks. A small selection of the mountain of them filled with all kind of things. I've never met a writer who doesn't love a good notebook. 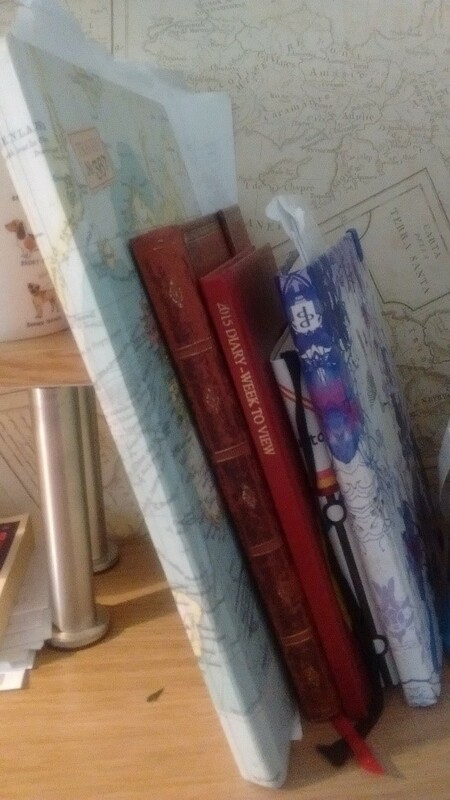 I wish I was more organised with them though; I've spent hours in the past, going through notebook after notebook, looking for some idea I had, or some sentence I'd written. I suppose what would be really handy would be to have an enchanted notebook where you could say a word or phrase and it would search for it and find it for you. Oh, hang on - that sounds like a computer. Can you see that? It's dust. I've written 'YA' in it. I suppose it's not just that it's inevitable, more that there's always something more important, and more interesting, to do. You know the poem, 'Dust if You Must'? Well, yes, that. Google it. This is stuck to the little shelf, reminding me on those days where it all seems so hard and the words aren't there and I doubt myself, that, hey that's my name, and it says 'author' underneath it. That's a thing I worked damn hard to be, and there it is in print. One of the very few non-writing things on my desk. This medal hangs from my lamp. It was bloody hard earned. The Outlaw is a 2.4 mile swim followed by a 112 mile bike and finishing with 26.2 mile run. In a long-distance event like this, you stand at the beginning thinking of all the strokes, all the turns of pedal, all the steps to run, ahead of you, and have to force yourself to ignore the doubt and carry on, one step at a time. Much like starting a novel - staring at a blank page you have to force yourself to ignore the doubt and just think one word at a time. One step becomes one mile, just as one word becomes one page. Eventually you'll get there. There are lots of things I haven't mentioned, like my laptop, the thank you cards, the postcards of images I like, the mug given to me at UKYACX in Birmingham, my notes, the cover for Cell 7 stuck to the wall, the stuffed toy kiwi sitting on the shelf my children bought me on holiday... I do love my desk, and thankfully the food wrappers, coffee cups and crumbs are out of shot! 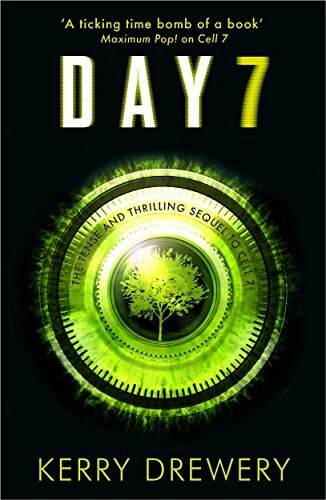 Kerry Drewery latest book - Day 7 - came out in June and is the sequel to the award-winning Cell 7 a book set in a world where the death penalty still exists and overseen by a reality TV show Death is Justice. Kerry is also part of The Prime Writers collective, find out more here.